I always used to love Puttanesca... rich tomato sauce with black olives, anchovies, garlic... all tossed in freshly cooked spaghetti. So now I don't eat pasta I came up with this. 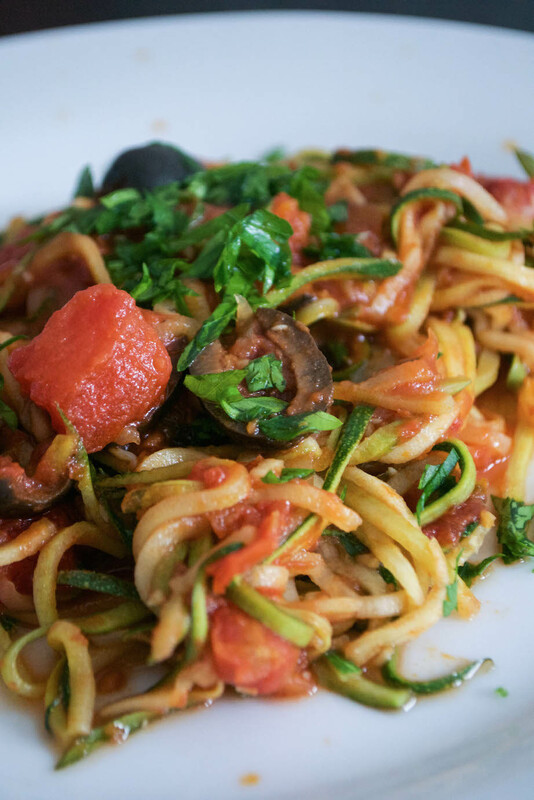 Paleo Puttanesca, made with courgette noodles. Or courgetti, or zoodles, or whatever you like to call it. The trick with this is not to overcook the courgette noodles so that they're soggy and break apart. Get them so they're just beginning to soften and then dump in the tomato sauce mixture. They'll wilt quite quickly in the hot sauce but still have a bit of 'bite'. First, heat the oil in a large frying pan and quickly chop the anchovy fillets and add them to the pan. Stir-fry for a few seconds - you'll notice the anchovies kind of melt into a paste. This is good. Add the chopped garlic and continue to fry for another few seconds, until aromatic, before adding the chopped tomatoes and the tomato paste. Bring the pan to a gentle simmer and throw in the olive halves. While that's simmering, wash your courgettes and trim the ends. 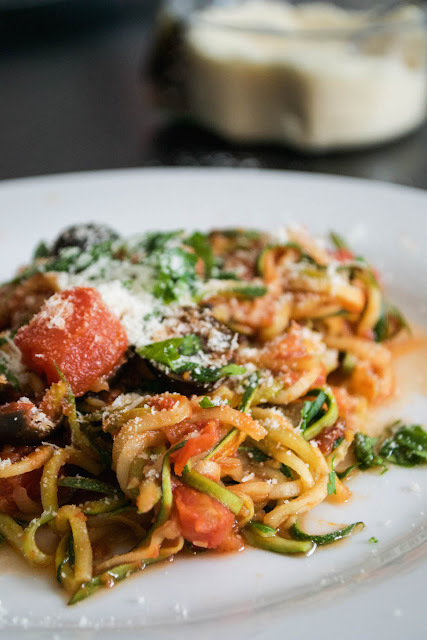 Put them through a spiraliser or julienne peeler, or just cut them into thin strips to make courgette 'spaghetti'. Heat a little of the olive oil (or other fat of your choice) and stir fry the courgettes strips for a couple of minutes, stirring and lifting them regularly with tongs. Once the sauce is bubbling and has thickened slightly, and the courgettes are just beginning to become tender, pour in the sauce and combine so the courgette spaghetti is well coated. Serve hot, with a sprinkling of Parmesan cheese if you like, or just a scattering of freshly chopped parsley.